Its been a while since I posted,call it blogger’s block or just plain laziness,I took a self-proclaimed break for a while and decided to come back with a bang! !I’ve not been bloghopping too off late and sorry if I haven’t visited your blogs for a while,soon soon,I promise. Even though I had not planned to stretch this break for so long,my Camera played spoilsport and I couldn’t take any pictures so I did not cook anything new..yeah:).I was forced into coming back to blogging by none other than Ajay who felt no blogging meant nothing new to eat! !He went and bought a kilo of Aavin butter recently because I keep cribbing about its non-availablity,but a kilo..? ?I had to do something soon. I was craving for a Chocolate cake and wanted to try out a new recipe.But on second thoughts,I felt I should make Brownies instead,at least I could freeze any leftovers and have it later[not that there were any,but by chance].I decided on a very simple recipe from Sanjeev Kapoor’s Cakes and Bakes. Brownies are one of America's best-loved culinary inventions. "Although the origin of brownies is not clear, they have been eaten in the USA since the 19th century, first appearing in the 1897 Sears, Roebuck Catalog," says Alan Davidson in the Oxford Companion to Food. James Trager, author of The Food Chronology, says the first brownie recipe was "probably created when a careless cook failed to add baking powder to a chocolate cake batter." This has been traced to a housewife in Bangor Maine, when her chocolate cake didn't rise properly and she cut out flattened pieces from the pan. Grease/line an 8’ square baking tin. Melt the chocolate and butter in a double boiler OR microwave it on High for a minute. Beat in the sugar,eggs and vanilla essence and blend well. Add the sifted flour and walnuts and mix well. Pour the batter into the tin and bake for 40-45 minutes. mmm....brownies look delicious! Perfectly cut! Once you take a blog break, it's so hard to come back!! Then once you start, it's hard to stop!! Hahaha!! looks awesome..i had tried out caramel brownies from sanjeev kapoor's book..was good.. I love love brownies. And these look morishly delcious. WOwwwww can i have some brownies, sooo tempting !! I love your site, and those brownies look delicious! 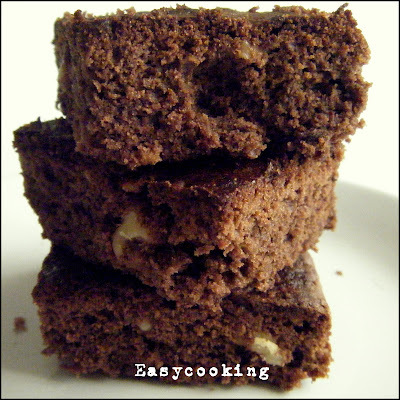 Brownies look sinfully delish! !Welcome back!! Happy FEB to you..blog ur lovely food/bakes ..too happy to read! Good Lord! You have got me craving for some of those now! Drooool! Divya!! Looks delicious!! Wish we had option on blogs to receive the brownies on request!! Brownies Look yumm.. Am sure they tasted great too! So happy to see you back here! I have those phases too, a LOT! Great way to come back though, brownies are my favorite! I have an award waiting for you at my blog. Pls accept and pass it on per rules. Wow... walnut brownies are my favorite. I often bake my good old recipe. Haven't tried it with dark chocolate though, this will give my favorite a new twist. I'll surely share my experience with you guys! this is looking so tempting..though i personally donot prefer sweets/deserts, but like to bake for my son. he just loves the chocolate cake.i am surely going to try the brownies too! Churmundo ~ A sweet start for the New Year! !